Here are a few fun maps and map-based tools for your Friday. Mapnificent - Pick your favorite city from its list and it will provide an estimate for travel time between two points, assuming you're using public transit. It's been around for a while but is still actively updated. See the Github here for more technical details. Windyty - an animated, global wind map with various weather overlays. It's quite pretty. It's a fancy version of the Earth project which has a Github here. Minimalist maps in R - a blog post from a few months ago with examples of data-only visualizations of geographic data. Using those examples, I made a quick map of US cities, shown below. 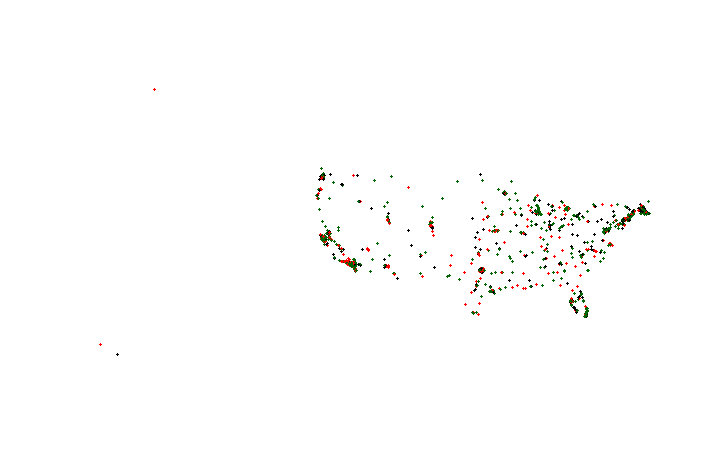 Red points are cities of >100,000 population, green are above 50,000, and all others are in black. This isn't technically challenging but does show how fun the basic datasets like world.cities can be. It's mostly white because of minimalism and maybe a little Americentrism.